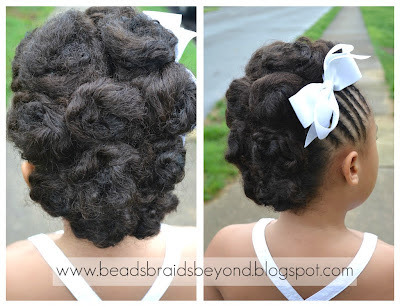 My daughter has been asking for a mohawk for months so I decided to pull some inspiration from our Facebook page and give her a cute, girly mohawk updo. She absolutely loves it! I think it's an adorable style for little girls, especially with cute Spring dresses. 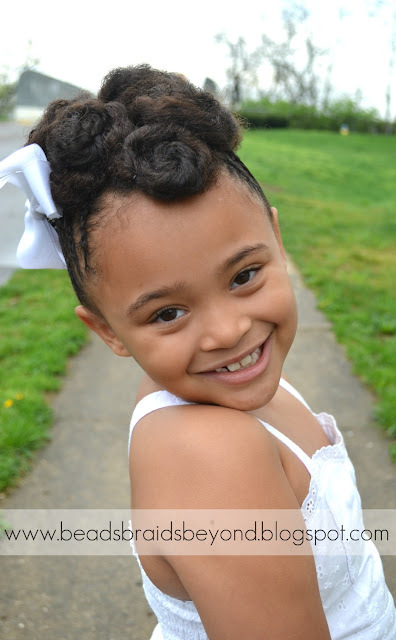 Jazz it up with a bow or hair pins and you're good to go! The style is actually very simple so I'll try to keep the instructions short. Miss A's hair was previously moisturized and banded so her hair was already stretched out quite a bit. If you're not into banding, you can completely skip this step. If you don't know what banding is, please check out our Banding F.A.Q. post. I began by parting the hair from ear to ear. I tied off the back so I could easily work with the top section. Using a metal rat tail comb, I made a slanted square. I tied off the middle section so I could cornrow the left and right sections. If you do not know how to cornrow, please check out our Cornrowing for Beginners post. 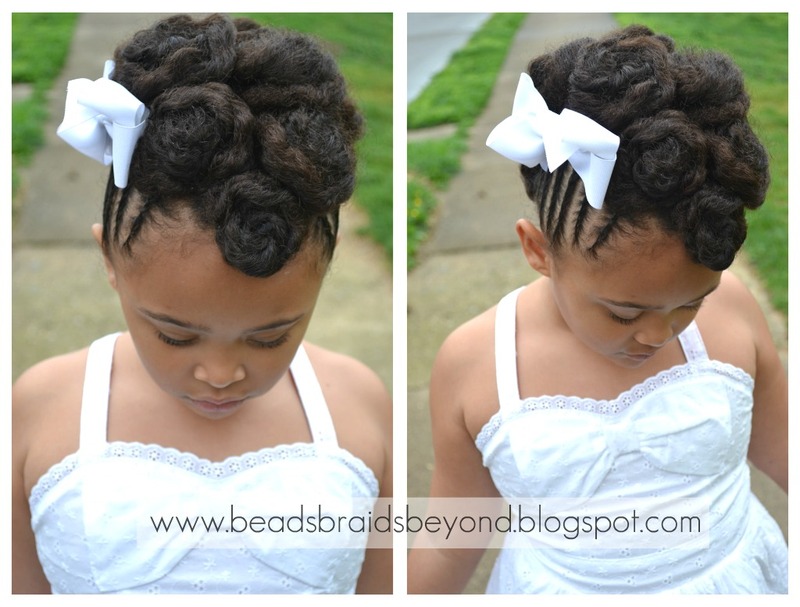 Flat twists would look just as adorable. I didn't want too much going on with this style so I kept the cornrows pretty basic. Just going straight up the sides. After cornrowing both sides, I untied the top middle section and parted medium sections of hair with my fingers. I grabbed a black ouchless band and loosely tied off about 8 sections. I two strand twisted each section and left them overnight. I untied the back of her hair and did the same thing. I knew she didn't need cornrows in the back because her hair is so thick so the little cinnabuns would have covered them. The next morning I removed the two strand twists, leaving the ouchless ponytail holders in. I gathered each section and wrapped it around each ponytail holder. I used a bobby pin to secure each little bun. I tried to make the buns kind of loose. I wanted a really full updo. Don't forget to "Like" us on Facebook! You will find a lot more updates and pictures there. Stunning style, I absolutely love it! This is one of the most beautiful styles I have seen you do! It is so simple and elegant and A looks FIERCE as always. She can work a camera! This style is absolutely gorgeous. I've been searching for a style for my flowergirls for my wedding in June and I've found it!! Thank you! Oh wow, I LOVE THIS! Just gorgeous!! So beautiful! I will definitely be trying this on my daughters hair. Her hair is about the same length, texture, and thickness. Will post pics. Thanks! This is so pretty! I'll have to give it a whirl...PS...where did you get that dress she's wearing? It's so cute!! OMG This hairstyle is awesome. OMG this style is awesome! Its so elegant... Looks like she is going to a wedding! OMG...This is so BEAUTIFUL and ELEGANT! I love it! I would love to re-post this on BGLH! Is it okay? I absolutely love this! I this we may try this for Easter. This style is Elegant and Beatiful!! Love it! This style is so adorable!! I want to try this on my own hair!!! Beautiful!! i love your blog!! Even her dress is beautiful! Stunning!